Oxygen is the element with atomic number 8 and element symbol O. Under ordinary conditions, it can exist as a pure element in the form of oxygen gas (O2) and also ozone (O3). Here is a collection of facts about this essential element. Discovered By: Credit for the discovery of oxygen is usually given to Carl Wilhelm Scheele. However, there is evidence credit should be given to the Polish alchemist and physician Michael Sendivogius. Sendivogius' 1604 work De Lapide Philosophorum Tractatus duodecim e naturae fonte et manuali experientia depromt, he describes "cibus vitae" or "food of life." He isolated this substance (oxygen) in experiments conducted between 1598 and 1604 involving the thermal decomposition of potassium nitrate or saltpeter. Word Origin: The word oxygen comes from the Greek oxys, meaning "sharp or acid" and genes, meaning "born or former." Oxygen mean "acid former." Antoine Lavoisier coined the term oxygen in 1777 during his experiments exploring combustion and corrosion. Isotopes: Natural oxygen is a mixture of three stable isotopes: oxygen-16, oxygen-17, and oxygen-18. Fourteen radioisotopes are known. Properties: Oxygen gas is colorless, odorless, and tasteless. The liquid and solid forms are a pale blue color and are strongly paramagnetic. Other forms of solid oxygen appear red, black, and metallic. Oxygen supports combustion, combines with most elements, and is a component of hundreds of thousands of organic compounds. Ozone (O3), a highly active compound with a name derived from the Greek word for 'I smell', is formed by the action of an electrical discharge or ultraviolet light on oxygen. Uses: Oxygen was the atomic weight standard of comparison for the other elements until 1961 when the International Union of Pure and Applied Chemistry adopted carbon 12 as the new basis. It is the third most abundant element found in the sun and the earth, and it plays a part in the carbon-nitrogen cycle. Excited oxygen yields the bright red and yellow-green colors of the Aurora. Oxygen enrichment of steel blast furnaces accounts for the greatest use of the gas. Large quantities are used in making synthesis gas for ammonia, methanol, and ethylene oxide. It is also used as a bleach, for oxidizing oils, for oxy-acetylene welding, and for determining carbon content of steel and organic compounds. Biology: Plants and animals require oxygen for respiration. Hospitals frequently prescribe oxygen for patients. Approximately two thirds of the human body and nine tenths of the mass of water is oxygen. Element Classification: Oxygen is classified as a nonmetal. However, it should be noted a metallic phase of oxygen was discovered in 1990. 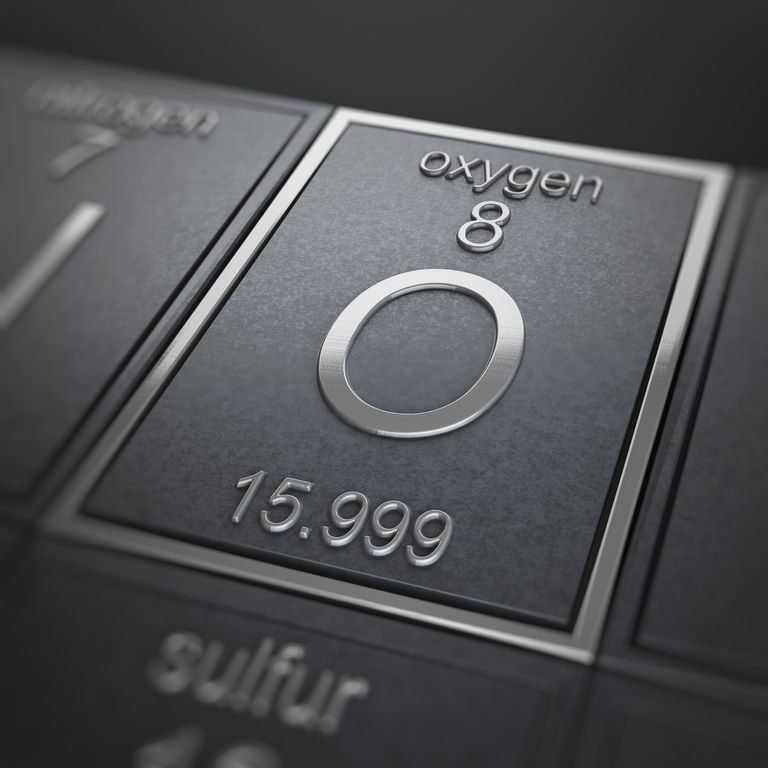 Metallic oxygen forms when solid oxygen is pressurized above 96 GPa. This phase, at very low temperatures, is a superconductor. Allotropes: The usual form of oxygen near the Earth's surface is dioxygen, O2. Dioxygen or gaseous oxygen is the form of the element used by living organisms for respiration. Trioxygen or ozone (O3) is also gaseous at ordinary temperatures and pressure. This form is highly reactive. Oxygen also forms tetraoxygen, O4, in one of the six phases of solid oxygen. There is also a metallic form of solid oxygen. Source: Oxygen-16 is formed primarily in the helium fusion process and neon burning process of massive stars. Oxygen-17 is made during the CNO cycle when hydrogen is burned into helium. Oxygen-18 forms when nitrogen-14 from CNO burning fuses with a helium-4 nucleus. Purified oxygen on Earth is obtains from air liquefaction. Quiz: Ready to test your oxygen facts knowledge? Take the Oxygen Facts Quiz. Greenwood, Norman N.; Earnshaw, Alan (1997). Chemistry of the Elements (2nd ed.). Butterworth-Heinemann. p. 793. ISBN 0-08-037941-9.